The Coalition for the Human Rights of Indigenous Peoples – made up of Indigenous Nations, Indigenous peoples’ organizations, civil society groups and individual experts and advocates – is commending Members of Parliament on the adoption of Bill C-262, a private members bill to implement the UN Declaration. Bill C-262 sets out a legislative framework requiring the federal government to collaborate with First Nations, Inuit and Métis peoples in developing a national action plan to fully implement the UN Declaration. 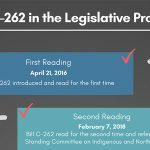 Adoption of C-262 into law will also require the federal government to work with Indigenous peoples to review and reform domestic laws and policies to ensure that they are consistent with the requirements of the Declaration. 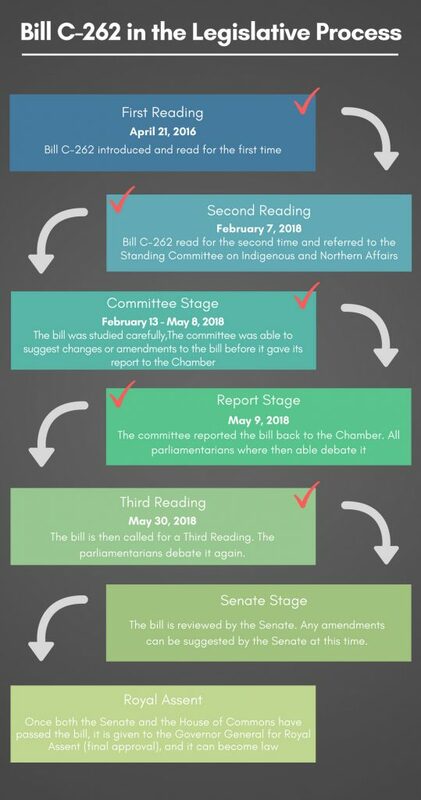 The ultimate purpose of Bill C-262 is to establish a principled and collaborative framework to move ahead with implementing a crucial human rights instrument that Canada and the international community have repeatedly affirmed represents the minimum standards for the survival, dignity and well-being of Indigenous peoples. The UN Declaration was the subject of one of the most extensive standard setting processes ever undertaken in the international human rights system. The collaboration between Canadian government representatives and Indigenous peoples during the final years of negotiation was a key factor in developing a text that could attain broad, global support. Today, the Declaration stands as a global human rights instrument, reaffirmed 8 times by the UN General Assembly by consensus. Bill C-262 sets out the principles that must guide implementation of the Declaration, including repudiation of colonialism. Bill C-262 requires a collaborative process for the review of federal legislation to ensure consistency with the minimum standards set out in the UN Declaration. Bill C-262 requires the federal government to work with Indigenous peoples to develop a national action plan to implement the UN Declaration. Bill C-262 provides transparency and accountability by requiring annual reporting to Parliament on progress made toward implementation of the Declaration.